This live boot camp will provide tax practitioners with insights on how to effectively incorporate estate planning, estate administration and tax compliance into their practice. Estate planning is a complex process that involves issues far beyond the technical legal aspects of community property laws or tax treatment of assets. Eli Financial, a division of audio conference and corporate education leader ProEdTech, will host the live virtual boot camp “Life Cycle Planning Virtual Boot Camp: A Two-Day Series on Estate Planning & Death Issues” with taxation attorneys Arthur J. Werner, MS (Taxation), and Anthony J. Rocca on Thursday and Friday, August 10 and 11, 2017 at 1:00 pm ET. This session will provide tax practitioners with insights on estate planning and death issues so as to best prepare their clients for crucial life planning decisions. Estate planning is a complex process that involves issues far beyond the technical legal aspects of community property laws or tax treatment of assets. Finding appropriate solutions to clients’ estate issues should involve planning for a range of considerations while they are alive, including the drafting of wills, setting up trusts, and examining all sorts of relationships and goals. At death, a whole other set of considerations will arrive, including estate administration, tax payments and how to actually distribute property. Tax practitioners must help their clients consider the whole picture. From utilizing charitable donations and considering life insurance to preparing for “death taxes” and retirement plan distributions, tax practitioners must know how to best prepare their clients for a range of important life planning decisions. This two-day, eight-hour boot camp with taxation attorneys Arthur J. Werner and Anthony J. Rocca provides the practitioner with information on how to incorporate estate planning, estate administration and tax compliance into one’s practice. 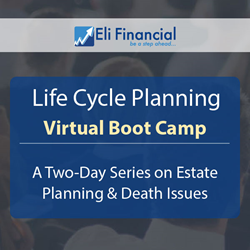 The Life Cycle Planning Virtual Boot Camp provides a detailed understanding of the tools and techniques applied in estate planning as well as those applied in estate administration and tax compliance. Arthur and Anthony will discuss the changing environment of estate planning, changes to the Internal Revenue Code and relevant developments in IRC, and how the estate administration process has evolved. ProEdTech regularly provides professionals the opportunity to get answers to their most complex questions directly from experts, without having to attend costly live conferences. To learn more, visit: http://proedtech.com/.